Glacier Pool Coolers are the perfect answer to uncomfortably warm swimming pools. Our swimming pool chiller is designed to solve the problem of hot pool water. 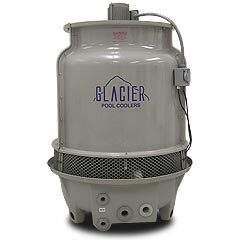 The Glacier Pool Cooler is a solution that is affordable, easy to install, and inexpensive to operate. Our coolers are electric fan cooling systems that require no Freon or gas to operate. The pool water circulates through the system, removing the heat from the water instantly. The chilled water is pumped back into your pool, giving you a refreshing and comfortable feeling while swimming during the hot summer days. Residential pools come in all shapes, sizes, and finishes. Glacier Pool Coolers has created a unit to fit your pool’s needs. The ICE CUBE (GPC-23) is designed for small play pools less than 10,000 gallons. The ICE BLOCK (GPC-25) will efficiently cool a pool up to 20,000 gallons, and the ICEBERG (GPC-210) can cool larger backyard pools up to 30,000 gallons. However, if your pool has a pebble finish (any color), quartz, tile, or any dark colored plaster bottom and your pool volume is close to the gallon limits above, you should go up one size when choosing your unit. Not only will your pool be refreshing during those hot summer months but your pool water chemistry will be easier to maintain. A 10 degree drop in water temperature (95′ to 85′) can result in a savings of 20-25% on chemical consumption. It is a fan based system not a heat pump, so it does not need Freon nor does it require the expense of operating a heat pump. Decreases the pool water temperature 10-15 degrees in 12 to 14 hours on average (residential pools) *See water temperature disclaimer below. Energy efficient (low amperage output) 110/115V 8.5 Amps 60/50Hertz. Gary and Ace Pool Services has been servicing our pool for the past year or so. The professionalism and consistency of service are exemplary. I can wholeheartedly recommend Ace Pool Services. If you don’t want to worry about your pool anymore call Gary. Integrity is doing what you say when you say you will do it. After owning four pools in three different regions of the USA over 15 years I can cite only one of the many pool companies I have used as having integrity – it is Ace Pool Service owned by Gary Lindsey. For the first time in my life I can say I have a worry free pool because of Ace’s integrity. We wanted to let you know how very pleased that we are with your pool service. From day one, your company has provided such a high level of customer service, great communication and excellent work. We have found you and your employee’s to be extremely professional, prompt & attentive. We appreciate that you are always available to answer any questions that we many have regarding repairs or services. Just wanted to let you know that over a year later, the decision to go with Ace Pool Services was the best one that we could have made. It is so nice to enjoy our “clean” pool with our children, grandchildren and friends.